A few months back I published a post about my large cash position. That position has only continued to grow as I find it difficult to put on any new investments at these lofty prices. As I stated previously, I have no idea when the market will turn, all I know is I don’t want to be left holding the bag when it does. That’s not because I don’t think that over the long-term the prices will be higher, but rather because I believe there are much better prices ahead (like around the corner). We’re in the second half of a bull market, so cash is currently trash. It’s very easy to say how everybody shouldn’t have cash when everything else is doing so much better. But I can assure you that if there is ever a multi-year correction again, cash will become king once more [my emphasis]. Everybody will prefer earning 0.1% on their cash rather than losing 30% in the stock market. I remember the difficult times during the Asian Financial Crisis in 1997, the dotcom implosion between 2000-2002, and the disaster of 2008-2009. People weren’t just taking a hit on their investments. People were getting fired left and right as well. Having to sell something when you don’t have to because of a liquidity crunch is the worst. Don’t ever forget the bad times. Everyone is a genius in a bull market and it’s easy to say that any and all idle cash should be put to work immediately if not sooner, especially when you’re essentially earning zero percent in the bank. It’s funny how everyone forgets about the cyclical nature of the market. They forget that on one side of the coin the market goes up for extended periods of time, but on the other side it also goes down for extended periods of time. Maybe you let some of those new deposits sit idle while you hold out for better prices. Build up the war chest to take advantage of lower prices. Maybe you work to reduce your margin (borrowed money from your broker), that way you’re not forced to sell anything when the inevitable correction does come. Maybe you liquidate some of those positions you recently put on near all-time highs. Maybe you sell covered calls against some of your positions to chip away at your cost basis. OR maybe you use options to get short the market with close to zero risk to the upside, an effective long price that is much lower than the current market high, and create a huge range of profitability. This post is geared towards option number 5. Thesis: The stock market is getting overheated and we are due for a correction. There may be a few more percentage points (5-7%) of upside before a market correction begins. A correction could bring a decline of 20-30%. Goals: Use options to create a custom strategy that allows for more than one way to win. I want to be able to make money if the market goes up, stays the same, or goes down. I also want my risk to be as close to zero as possible if the market exceeds my upside target. And lastly I want an opportunity to get long at much lower prices (8-10% lower from the highs). Instrument: I will use options on the SPY ETF as a proxy for the S&P 500 to construct my strategy. Upside Price Target: I don’t think SPY will close above $230 by the end of 2015. If I am wrong I want to structure my risk in a way that I could profit all the way up to this price and lose little to no money if we exceed this upside target. With a price ceiling of $230 that would equate to a 12% return for 2015 (based on the closing price of $205.54 on 12/31/15). Long Entry: If the market does fall, the first price level I would be interested in getting long at would be around 8-10% lower from current all-time highs. As of 5/21/15 the all-time high was $213.78. This means I am okay with an effective price between $192 to $197. Now that I have my list of the requirements it is time to start piecing the strategy together. In order to meet all of the requirements it is going to require both selling options (both a put and a call) to collect a bucket load of premium as well as buying an option to cap risk to the upside (a call). I personally use Think or Swim from TD Ameritrade to play what if analysis in finding the right strategy. You will see some screenshots below. Below you can visually see the area of profitability as well as both the upside and downside break even points. Based on the breakeven point to the upside that still allows the SPY to finish up approximately 12% on the year (based on a 2014 closing price of $205.54), the risk to the upside is capped due to the purchase of the $230 call (within the callspread). Upside Max Loss: The max loss is $63 to the upside. It was the closest I could get to zero risk to the upside. I am totally fine with that. Downside Max Loss: The max loss to the downside is theoretically $19,563, but that would mean the ETF goes to zero. I am not concerned with the downside on this, because I am comfortable owning the ETF at $195.63 if exercised and forced to take possession. Profit Zone: Anything Greater than $195.63 and Less Than $229.39. Notice the peak at approximately $212.50, this is where maximum profit is earned ($1,637). With markets at all-time highs I am trying to find creative and interesting ways to put my capital to work for me. Some in the community would argue that the problem with having cash on the sidelines while waiting for a market to move lower is that most will get scared and never pull the trigger on the way down. This custom strategy forces my hand to get long at a price I am comfortable with (at least for my first tier of purchases). I like that the risk to the upside is pretty close to zero ($63) and that I have locked in a price to get long the SPY at $195.63 should the market correct more than 8%. The worst case scenario to the downside is that I take ownership of the stock. Of course the market could keep falling, but that is true no matter what price you get long. I profit up to a max of $1,637. 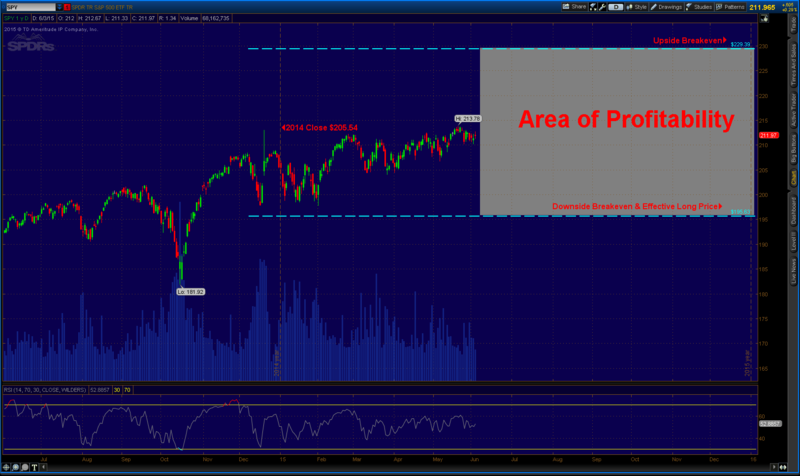 I take ownership of the SPY at a price that is currently about 8.5% lower than the current all-time high. To point out the obvious, if the SPY were to correct past my breakeven point of $195.63, I would be in negative P&L position. Does this sound interesting to you? Have you traded or invested with options? Do you have any questions? Please share your thoughts and questions in the comments below. I promise to respond to everyone of them. In the next couple of months I am going to be launching a options coaching program. If you think you might be interested in learning how to us options to enhance your returns, reduce risk, and profit like a pro then enter your email below to be one of the first to be notified. The coaching program will have limited spots and will be on a first come first serve basis. First off, nice article GenY. The pictures really help bring it together. I too have heard multiple accounts of how the market is gunning for a severe dip (correction). However, I don’t know that I feel a need to deviate from my plan during it. Here’s some additional supporting evidence for the upcoming recession from multiple sources(Here’s one: http://bit.ly/1JHXabA). After all, there is a recession, on average, every 10 years. The last major recessions have been on ’81, ’90,’01,’08. With that in mind, anytime between 2016 and 2018 would be a good expectation for the next dip. That leaves us with two options: try to play for the upcoming recession or stay the consistent course. The disadvantages of trying to account for the recession is that I might lose out on potential returns in the short term. Given that the longest recession to date has only lasted a handful of years, this is really not a big deal. So alternatively, I can stay the normal course. Invest money continuously (low, high, medium doesn’t matter). The pros include much lower stress, a more reliable ability to take advantage of the lower prices in the future (albeit with lower returns than your best case scenario). The cons would be that some may need to withdraw cash in a down market. Personally, I believe that if someone is so strapped for cash (no emergency fund) that they can’t withstand even the most negative outcomes of a down market (layoff) then they shouldn’t have been investing anyways. Conclusion: My opinion is to stay the course, protect the home front and use my security to take advantage of good deals as they present themselves. In the end, the stock market has a much greater confidence of providing anyone with wealth if they invest for the long run. If I end up needing quick money, I’ll find it from work, not investments. Keep us posted about how it works for you! I definitely recommend that you do what works for you and your financial goals. I incorporate a lot of different strategies in my investment portfolio. I am working on a piece that the Buy and Hold crowd should love. It’s a new piece of my portfolio dedicated to just buying every week. My brain is still working out how all of this works. Can you split out in options what selling the call spread means? I tried some scenarios myself, but I mess up somewhere in the process. When you sell a callspread it is actually selling a call option and buying a call option at the same time. So in this example I sold the $213 Call for $7.64 and bought the $230 Call for $1.11. To get more profit and to have the protection via the above, you sell a put at 212. This obliges you to buy when below 212, but you have the 16,37, thus you get to pay worst case 195,63. I think I have figured it out now. I needed to write this down to get it fully clear. – Selling the $213 call actually obliges me to sell stock short at $213. Because I collected a premium of $7.64, this actually moves my effective short price up to $220.64 (my break even with just this call). – But then as you pointed out I sold the $212 put to reduce my upside risk to as close to ZERO as possible. So by selling the $212 put for $9.84 this again raises my break even point. Now the break even to the upside is $229.37. So now the max loss to the upside is just $0.63 ($230 strike price – $229.37 break even). – And then on the downside since I sold the $212 put I am obliged to buy at $212. However, my effective price is actually $195.63 ($212 strike price – $16.37 premium collected). So now I have a huge range of profitability from $195.63 to $229.37. Anywhere within this range I make money, with the max profit of $16.37/share (or $1,637 on 100 shares) at around $212.50. My max loss to the upside is $0.63/share (or $63 on 100 shares). And my worst case scenario on the downside is that I have to buy this stock at about 8.5% off of all time highs, which is a much better alternative than paying the all time high price and suffering a 8.5% decline. I hope that helps solidify this for you. I was on the verge of trying out some option strategies some time ago, but decided to keep things simple and stick with the direct stock investing. I always enjoyed studying derivatives and the interesting risk / reward payoffs you can apply though, and there’s some great potential here if you do your homework and are disciplined. I think the options market is a little less liquid here in Australia too, and haven’t been adventurous enough to look into the US market. Really interested to hear how some of these strategies pay off for you in the long run! I was also trying to work it out in my head and it seemed not to work. But from the explanation you have given Amber, i now understand these strategies and am fascinated at how they could really pay off. On 8/5/15, I closed this trade out by buying back the short 213/230 callspread and the $212 short put for a combined $12.97. This position netted $3.4 or $340 in profit. So I was able to capture about 21% of the profit potential in a little less than two months. Will be looking to put a similar position on at lower strikes with the recent sell off in the market. Ok, so I ended up doing the same type of trade, but this time I moved the expiration up from December of 2015 to January of 2016. I sold the 207/220 callspread for $5.93 and the $207 put for $8.52. The total premium collected was $14.45 or $1,445. This time I make money at any price greater than $192.57. Worst case is that I take delivery of the SPY ETF at an effective long price of $192.57 or at a price that is 7.3% lower than current market prices. The max profit on the trade is $1,445. I can’t lose any money to the upside based on the strikes I have chose. Even on an extreme upside move that blows past $220, I make a minimum $145 in profit. Maybe I will do a separate write up on this with the visuals. The 3nd Friday of Jan 2016 was gone. How much did you lose on the closing day? With all the SPY you own, now, you can play another 6 months for the covered call. Game is on! Hey Jay – If you look up at my comment from Aug 6th of 2015 you will see that I actually closed out this original trade before expiration for a $340 profit (about 2 months after I put it on). I then put on a similar trade at different strike prices and ended up closing that one out for something close to $600 (don’t remember off the top of my head). I don’t know how familiar you are with trading options, but you don’t have to hold options to expiration. What I love about options is the theta decay (i.e the fact that options lose their value as time passes, which when you are a seller of options allows you to buy back the options at less than you sold them for and the spread is your profit). I currently have a similar trade that I will post about in the next week or so. Now that I start to get familiar with options myself, I can only agree with GYFG. The cool thing about writing options is the time decay. As soon as the profit is significant, I usually take the trade off the table. It does make sense indeed. The return of $340 on $20,000 cash secured over 2 months is a good trade in 2015. However, risk is very much correlatively built in the option premium, and overpriced options are few and far between. In order for me to be convinced that trading SPY options is a sustainable investment, I would like to see a comparison on buy-and-hold SPY vs writing SPY options in a duration of at least 5 years. As far as I know, no one can claim a result to beat SPY by trading SPY options in a long run. HVPW might be the only ETF closest to the strategy. Yes, and over the course of the year I actually collected about $2,000 on the $20,000. But I also would have been okay taking delivery at my effective price. i like the way you think on this spy trade. do you currently have a trade on and if so what is it? Hey Walter – I actually closed out this trade sometime back in 2015 and if you read through the comment string you can see that I ended up earning about $340 in profit on it. And I have put many similar trades on since.